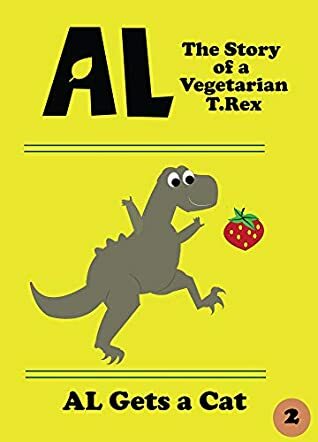 Al Gets a Cat (Al, The Story of a Vegetarian T-Rex 2) by Ronald Stoltz is a children’s animal fiction tale that would appeal most to a mixed audience of young children and parents who enjoy animal and dinosaur stories with a moral. Al’s parents get a kitten, thinking that she is an ordinary house cat, but her fast growing teeth soon make it clear that the kitten is no house cat. It is a saber tooth tiger! Being a saber tooth tiger makes it hard for the kitten as she is unable to play fetch or catch mice, which soon leads to the parents sending her away. Will Al manage to convince his kitten to give his home a second chance or will the kitten choose to stay away? Al Gets a Cat by Ronald Stoltz has a cute cover that shows Al, which made me interested in the book as I wanted to find out how a T-Rex could have a kitten. The book itself is filled with cute pictures of Al, his parents, and the saber tooth tiger kitten. The young kitten, Sally, was my favorite character and I could not help feeling that young children could sympathize with her and how she was not considered normal. The moral of the story teaches young children that just because someone is different does not mean that they are useless or that they deserve to be bullied. Overall, this is a charming animal story book filled with a great lesson.